The Portuguese Web Corpus (ptTenTen) is a Portuguese language corpus made up of texts collected from the Internet. The corpus belongs to the TenTen corpus family which is a set of the web corpora built using the same method with a target size 10+ billion words. Sketch Engine currently provides access to TenTen corpora in more than 30 languages. Data was crawled by the SpiderLing web spider in March 2011 and August 2012 which yielded almost 4 billion words. The corpus contains both of the main language varieties – European and Brazilian Portuguese. The chart shows the distribution of the parts of speech in the Portuguese Web corpus 2011 tagged by FreeLing version 3. Kilgarriff, A., Jakubíček, M., Pomikalek, J., Sardinha, T. B., & Whitelock, P. (2014). PtTenTen: a corpus for Portuguese lexicography. Working with Portuguese Corpora, 111-30. Kuhn, Tanara Zingano, and Iztok Kosem. “Devising a Sketch Grammar for Academic Portuguese.” Slovenščina 2.0: empirical, applied and interdisciplinary research 4.1 (2017): 124-161. Kuhn, Tanara Zingano (2017). A Design proposal of an on-line corpus-driven dictionary of Portuguese for university students (doctoral dissertation). University of Lisbon, Lisbon, Portugal. Kilgarriff, A., Pomikalek, J., Jakubíček, M., & Whitelock, P. (2012). Setting up for corpus lexicography. Skin, 1, 1-38. 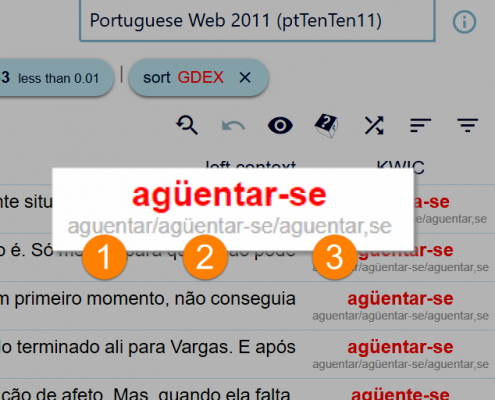 Sketch Engine offers a range of tools to work with this Portuguese corpus. (1) lemma – the basic form of a word, typically the form found in dictionaries.